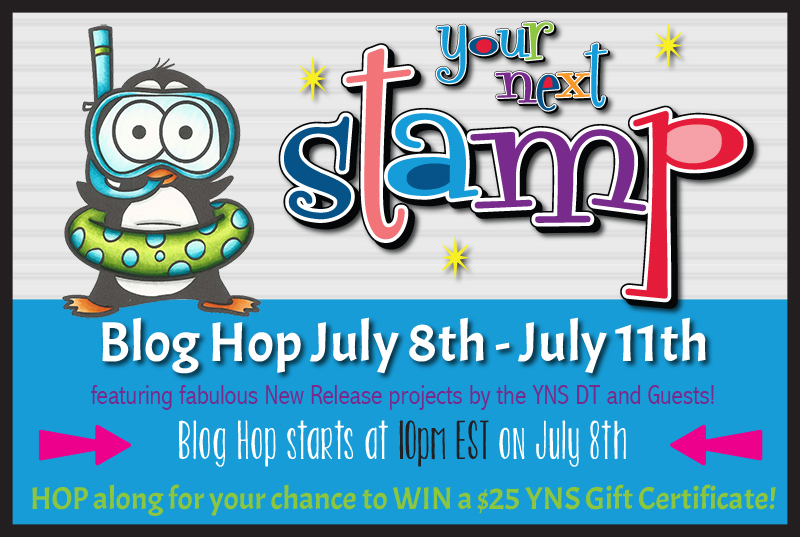 Hollybeary Creations : YNS July Release!!! 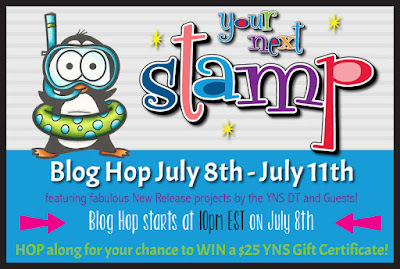 It's time for the Your Next Stamp July Release.. And this month it's a Re-Release. We are bringing back some of our Favorites sets. My first project features the Fun set Boom!!! This set if perfect for July 4th and and celebration. I used the Peek-a-Boo Trip Die set to create some Windows in a Panel I did cut using the Stitched Rectangle Die set. Then I added some Doodlebug Pattern paper behind the window. I adhered the panel to a Red A2 size card base. Then I stamped each image with the Black Olive Ink pad and colored them in with Copics. I used the coordinating dies to cut them out and adhered them over the windows with some foam tape. 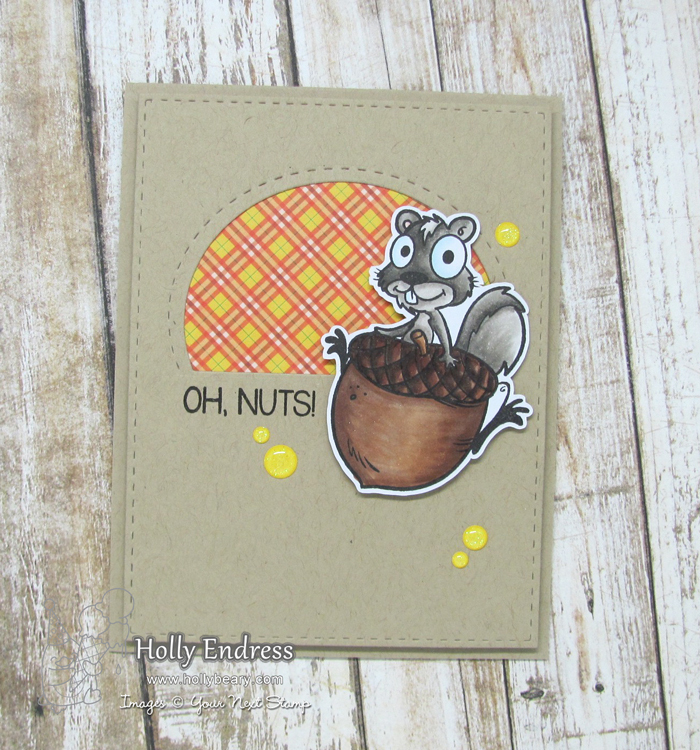 My second card showcases the new Summer Plaid 6x6 Paper and the Super Cute Acorn Fun Set. I created a window on a Kraft card panel that I die cut with the Stitched Rectangle die set and the Peek-a Boo Window Large die set. Then I added some of the Summer Plaid paper behind the window. I stamped the image in some Black Olive ink and colored it in with Copics. Then I cut the image out and adhered it over the window with some foam tape. I stamped the sentiment in some Black ink and added some Sunset Sparkle gumdrops. Hop along for more fun Projects featuring the Re-Release and a few new projects. Be sure to leave comment along the way for a chance to Win a Gift Certificate to the store. These cards are delightful, Holly. Great choices for this re-release! Holly, I love the way you used your designer paper behind a cut out image. Never tried that before. Thanks. Would love to win - thanks for the chance! Cute cards! Love your cards. Da bomb is just the cutest. Very cute cards, I love the expressions on those cute images!! Perfect for any celebrations and the other one is so adorable! Beautiful,super fun cards!And very nice coloring!Thank you for sharing! So cute! Love the peek a boo window and paper choice! Such fun cards! Love your coloring of these cute stamps and use of patterned paper! Cute cards. the first one would have been perfect for my son's birthday on the 4th. That plaid paper is fun". I love the orange and yellow. It's perfect for fall cards! Sorry, Holly, but I clicked on Becky's link but .I guess it's linked incorrectly to you. Love your cards. You can delete my last comment. Two very fun cards! Love them! Cute cards! Your squirrel card cracked me up! Lovely coloring! Total cuteness! Your cards are da bomb.com! So so sweet ,love the sayinf your da bomb!!! lovin the paper pad too and the special design of each card!!! Great cards! I love YNS designs, so much fun to color. 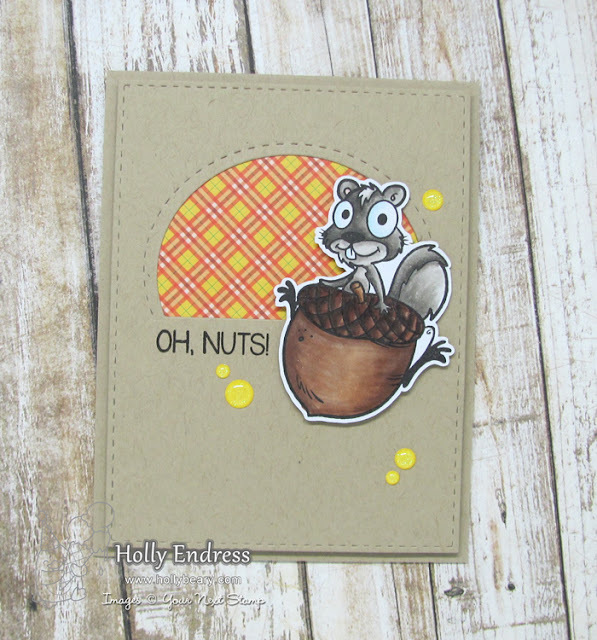 Fun cards Holly, love that plaid paper and fun images! Super cute Holly. I love how you used the dies and papers with these cuties! You Da Bomb! These cards are adorable! Such fun cards. 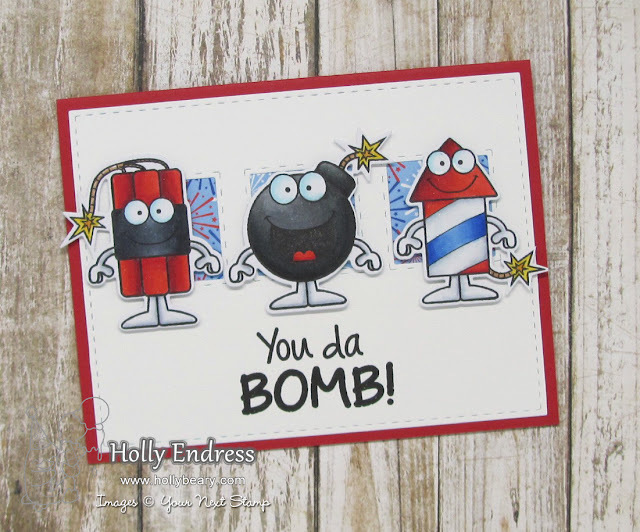 I especially love the Bomb card. Love your cards, very fun design! Hi Holly! Beautiful cards. These designs are amazing!! Thank you for sharing your talent and nice craft work!! Regards. Love both cards! Squirel is the cutest! I just got my first set of stamps. Love them. Both of your cards are so cute! I'm glad to see both of these sets have been re-released, too! oh my gosh! these are both so super cute! Great cards! Love the fireworks so fun and the squirrel cracks me up! I love cute & quirky cards. These are marvelous! Oh, these are so darn cute! this hop is so full of cuteness! Fun cards, love the boom set! Gorgeous cards. Love them both!